The 1964 Socorro UFO -- Explained??? The Socorro, NM UFO - Explained? My name is Ron, and I was born in Socorro 2 months before the sighting. My mother worked at the First State Bank at the time, and knew Polo Pineta and Lonnie Zamora. Lonnie was pursuing a couple of teenagers leaving town, and broke the chase to investigate something he saw. He reported a silvery craft, angular, with spindly legs, and had markings "like what Boeing puts on their planes", and "two in silvery suits who got into the craft and left". This was NOT a balloon-looking craft. My mother and father went to the site the next day. They saw (along with a bunch of locals) some depressions in the sand, like the pads of a medium-weight craft had set down, and a bush with some scorch marks and possibly some kind of oily substance (mom didn't touch it). In the summer of 1965, my mother saw a picture of the LEM (Lunar Excursion Module) in the Midland, TX (where we were living at the time) newspaper, and her first reaction was, "That's Lonnie's spacecraft!" She read the article, and discovered it was a picture of an Apollo LEM on display. I hope this helps. I'm Ron's mother and he forwarded me (as you can see) what he had sent you. On the evening of April 24, 1964, my husband was at the college campus - NMIMT where he was a senior majoring in physics. I was at home with our new baby (Ron). He called and asked if I had the radio on - the campus was abuzz with a UFO that had been sighted. I turned on KOMA out of Oklahoma City which is the station we listened to at night and it was abuzz! Holm Bursum III was president of the First State Bank and Polo Pineda was his right-hand man. At the time of the sighting, Polo was acting police chief. I'd worked there since Sept. 1961 first in the real estate department under Ruth McKibben and then moved to the bookkeeping department but still took my morning breaks with her, Polo and one of the tellers. On Monday morning we were in the kitchen when Polo came in. He was as mad as a hornet. Ruth asked him what was going on with the UFO. His first comment was that he'd been told that he wasn't to talk to anyone about what had happened but this was his town and he'd talk to whoever he pleased! He sat down with his coffee and proceeded to tell us. My mother passed away in 2000. In going through her effects, I found that she had kept the letter I had written her about the UFO during the week after the sighting. The description I gave back at the time matched exactly what I remember from the day. In the late '90s, Ron and I were in Roswell and stopped at the UFO museum there. I told the operator about the Socorro sighting and my belief that it was a LEM. Socorro sits very close to White Sands. He said he'd try to look into it and let me know what he found out but I never heard from him. About six months later, there was a statement issued by a government agency that the Socorro UFO was actually the LEM. Now I don't know if it truly was or if the gentleman at the museum had talked to someone and they felt that was a good way to explain it. If you want to put this on your website, you're welcome to do so. I'd really hope that others that were in Socorro at that time would add what they saw. The story has become so bizarre that I'd really like to see facts. NMSR thanks Ron, and Dorothy Landoll for a fascinating explanation. I think we may have been at New Mexico Tech at the same time. I attended there from 1973 through 1979 taking my BS and MS in Mining Engineering. In any case, I just came cross your NMSR website when I was looking for information on the Socorro Saucer. I hadn�t thought about it in years but now that I am semi-retired I have more time on my hands and have been cleaning out my desk of files on various subjects. In short, I know the answer to the Socorro Saucer Siting because I talked to one of the people who was on the other side of the arroyo that morning when Officer Zamora showed up. His name is Bruno R____ and he was a mining engineering student at Tech in the early 1960�s. Reading over the account by Officer Zamora his original description seems to fit well with Bruno�s account. It is the �filling in� of details where the mystery arises. For instance, when people went back and found four burn spots, these became a configuration of thrusters from a vehicle, not the scorched remnants of multiple dynamite explosions. Also important is that this was not a hoax. Bruno and his friend were not trying to fool anyone. This is just a case of an observer trying to explain something that they have not seen before. Over the years I have told people this story as an example of how a very straightforward event can get blown way out of proportion. I even sent it off to �Unsolved Mysteries� thinking that they would be interested, but I never heard anything back from them. I guess I should have realized that the show was called �Unsolved Mysteries�, not �Solved Mysteries�. In any case I figure that now that Lonnie Zamora is gone someone should get this all on the record before Bruno kicks the bucket too. I haven�t talked with Bruno since the 1980�s so I don�t know if he would be willing to come forward, but an organization like yours might be able to coax him out for the good of science. I have found Bruno�s LinkedIn page and it appears he lives in Felton, CA. I will leave it in your hands. The May 1, 2006 story is on-line here, and the video of the entire segment is on-line here. (An edited version of this article originally appeared in the July 2001 Skeptical Inquirer). The Socorro, New Mexico UFO "Landing" of April 24, 1964 has long occupied a prominent place in UFOlogical lore. The case put New Mexico on the UFO map, and was only overtaken by the Roswell Incident when that legend emerged from obscurity and blossomed in the late seventies. The case is still highly regarded; Patrick Huyghe recently wrote about the Socorro sighting in The Anomalist, No. 8 (Spring 2000), in a piece titled "The Best UFO Case Ever? A Review and Update of the Socorro Incident." The witness in the Socorro case is a well-respected policeman, Lonnie Zamora, who claimed in the report he filed (included in Project Blue Book, Brad Steiger, Ed., 1976) that he saw a flame in the sky, "bluish and sort of orange too...sort of motionless flame, slowly descending. ... narrower at top than at bottom...Sun was to west and did not help vision. Had green sunglasses over prescription glasses. Could not see bottom of flame because it was behind the hill....noise was a roar, not a blast..." The policeman drove around the area trying to see the flame again, and said he suddenly came across "a shiny type object ... oval in shape. It was smooth - no windows or doors. ... seemed like O in shape and I at first glance took it to be overturned car." He also described "two people in white coveralls...two persons..." Zamora said he saw the two people at a distance of 150 to 200 yards, and that "they appeared normal in shape... but possibly they were small adults or large kids." He also noted "what appeared to be two legs of some type from the object to the ground...the two legs were at the bottom of the object, slanted outwards to the ground." Zamora then got closer to the object, got out of his car, heard a loud roar, saw a flame, ran, bumped his leg, lost his glasses, and kept on going. He saw the object fly up, and move 10 to 15 feet above the ground, and then leave the area "travelling very fast." He radioed his dispatcher to look out his window for "an object .... it looks like a balloon." Nearby, the bushes were still smoldering. News reports in the local paper, El Defensor Chieftain, also mentioned "an unidentified tourist" who remarked about how "aircraft flew low around here," and that the strange object was a "funny-looking helicopter, if that's what it was." Zamora's earnest nature and credibility, along with the physical traces, brought the Socorro "landing" to national attention. J. Allen Hynek came to town, and was very interested in the pod-like tracks and burn marks at the scene. Ray Stanford wrote a whole book about the incident, Socorro Saucer in a Pentagon Pantry. Phil Klass came to investigate. The Socorro event has appeared in numerous books and articles, and was even featured on Unsolved Mysteries. But what really happened there? There are numerous hypotheses, of course. Stanford thinks it's another case of extraterrestrial visitors and government cover-up. Phil Klass, in UFOs Explained, makes a case that the whole thing was cooked up by the mayor to give Socorro some publicity. (Incidentally, Klass argues that the "unidentified tourist" could not possibly have seen both the craft and the police car.) Yet another hypothesis is that physics students with a little too much extra time played a trick on the town, but that rumor doesn't have much credible support. Major Hector Quintanilla, the Blue Book investigator for the Air Force, looked into the possibility that the craft was a prototype of the Lunar Landing Module being developed for the Apollo moon program, but found that no lunar lander prototypes were operational in April of 1964. Recently, Larry Robinson of Indiana University has suggested that Zamora saw "a manned hot air balloon." That scenario does match some aspects of the descriptions, such as the pitch changes from low to higher frequencies Zamora reported hearing from the flame, which might be a match for the propane burners of hot-air balloons. Yet another possible candidate has emerged in recent years, about the time of the identification of the source of the Roswell Incident to a specific program, New York University constant-level balloon launches from Alamogordo in the summer of 1947 ["The Roswell Incident and Project Mogul," S/I July August 1995]. 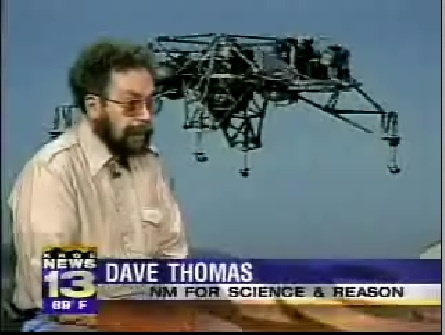 One of the participants in these launches, Charles B. Moore, stayed in Socorro and taught atmospheric physics at the college there, New Mexico Institute of Mining and Technology (my Alma Mater). Moore, now retired, has had a very distinguished career, and received the prestigious American Institute of Aeronautics and Astronautics (AIAA) Otto C. Winzen Lifetime Achievement Award for his scientific exploits, which included flying a balloon to the very edge of space. He visited the Socorro "landing" site in 1966, and thinks that Lonnie Zamora is sincere, and that he really did see something strange on that day in 1964. In 1995, a colleague of Moore's who ran the Skyhook Balloon program at Holloman Air Force Base in Alamogordo, Bernard "Duke" Gildenberg, learned from Capt. James McAndrew, the AF's point man on Roswell, that on April 24, 1964, there were special tests being conducted at the north end of the White Sands Missile Range (WSMR) involving a helicopter used to carry a Lunar Surveyor around for some tests. 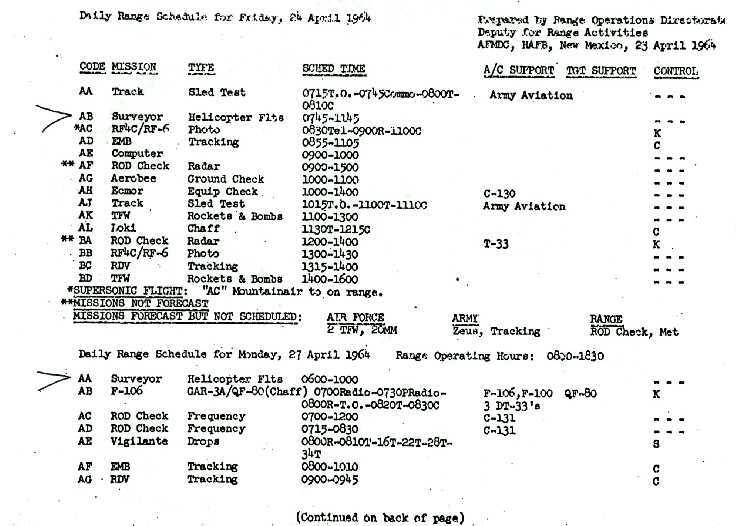 A portion of the WSMR Range Log obtained by McAndrew appears below. Surveyor was a three-legged, unmanned probe, which was used to learn about the moon before the Apollo program got there. 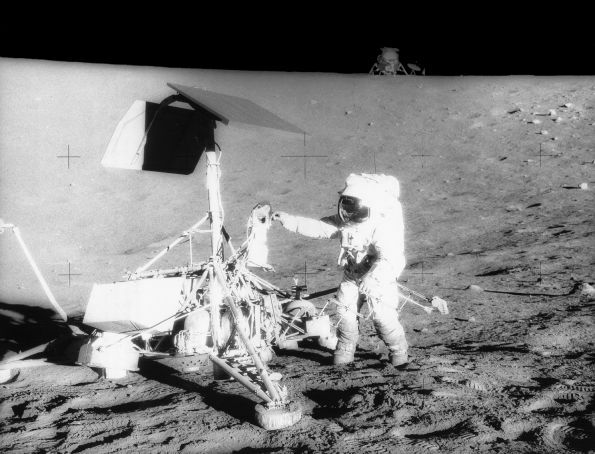 In fact, the Apollo 12 astronauts paid a visit to Surveyor 3 almost three years after it had landed on the moon. This new angle on the old Socorro story was first mentioned publicly in a brief piece in the July 15th, 2000 edition of James Moseley's Saucer Smear. The timing isn't right for the UFO sighting -- the range log calls for morning tests, and the sightings occurred in late afternoon - but then things don't always go "according to plan," and many tests which have defied completion by morning have been known to somehow get finished up in the afternoon. In fact, bombing runs scheduled for that part of the range might have delayed the tests. There are many other tantalizing bits that might support the Surveyor explanation for Socorro. o The Surveyor tests were done with a small Bell helicopter that supported the craft from its side. The helicopter and spacecraft would have presented a bizarre profile. The Surveyor's slanted legs fit Zamora's description well, and are also a match for the shape of the "landing pod imprints" found later. In Stanford's 1976 book, he mentions Phil Klass's comment that landing pads like Surveyor's were among the only practical shapes for that function. o The spacecraft used vernier engines and attitude jets to probe and sample soil, which could explain the flames the policeman saw, and the burn marks many saw. The flames weren't being used for lift; that was supplied by the helicopter. The burn marks at the site did not indicate sufficient thrust to lift a large vehicle, according to Hynek. o The Surveyor used a mechanical scoop with a shape that matches a rectangular trough photographed at the Socorro site. o Zamora described the craft as "aluminum-white," which certainly matched the bulk of the Bell helicopter. o The tests missions were manned by a helicopter pilot and a Hughes engineer ... two persons, in white coveralls. o Most people in Socorro, and several of the investigators, thought it was most likely a secret government experiment, and some Blue Book researchers even pinned it down as a tenant operation run by Holloman, the base for the Surveyor test flights. Of course, this new evidence is far from conclusive. A lot has happened since 1964, and it's difficult to reconstruct events from that long ago, especially events with strong implications. Was it a college prank? A hoax? A balloon? An alien craft from another world? Perhaps we'll never really know. Gildenberg is confident that William of Occam, of Occam's Razor fame, would think kindly of the Surveyor explanation, especially over some of the other contenders. Three years after the unmanned craft Surveyor 3 landed on the moon, the Apollo 12 manned mission touched down nearby. This image shows mission commander Pete Conrad retrieving items from Surveyor 3; the Apollo 12 lunar module appears in the background. Photograph by Alan L. Bean, courtesy NASA. The Socorro Landing has a special place in my heart, as it sparked my first skeptical curiosity. Back in 1964, I was an 11-year old boy living just 90 miles north of Socorro, and the Socorro UFO story was big news in the young boy community. Some neighbor kids drew the outline of an alien foot in the alley, and tried to convince me it was real, but I "debunked" the assertions by pointing out the unnatural concave shape of the "feet," and the over-large distance between prints. After the neighbor kids confessed, I penciled in a little UFO on a photograph of my back yard, and showed it to them. I expected them to laugh it off as yet another hoax, but was surprised when the former hoaxers bought into my doctored photo hook, line, and sinker. That was my first encounter with the Power of the Paranormal; I'm sure it won't be my last.